Welcome To The Food Over 50 Cook & Plate Challenge! ​Get your whisks, peelers and mixing bowls ready! This is your monthly opportunity to win great prizes while making the recipes from our new series! Preparing, styling and photographing fresh, nutritious, healthy recipes for the Food Over 50 Cook & Plate Challenge can be a family affair! Are you ready? ​Anyone, at any age, with the culinary appetite and creative curiosity to show us your version of the recipes from our show! ​WHERE IS THE CHALLENGE HELD? Within the comfort, safety and inspiration of your own kitchen. Once you’ve prepared the dish according to our recipe, let loose your artistic flair. Plate, style and garnish the finished recipe any way you wish. After all, we eat with our eyes too, don’t we? Our Cook & Plate Challenge takes place roughly every six weeks. You will have two weeks to cook, plate, photograph and submit your entry! The winner will be announced approximately one week later, once we’ve reviewed and judged all the entries! 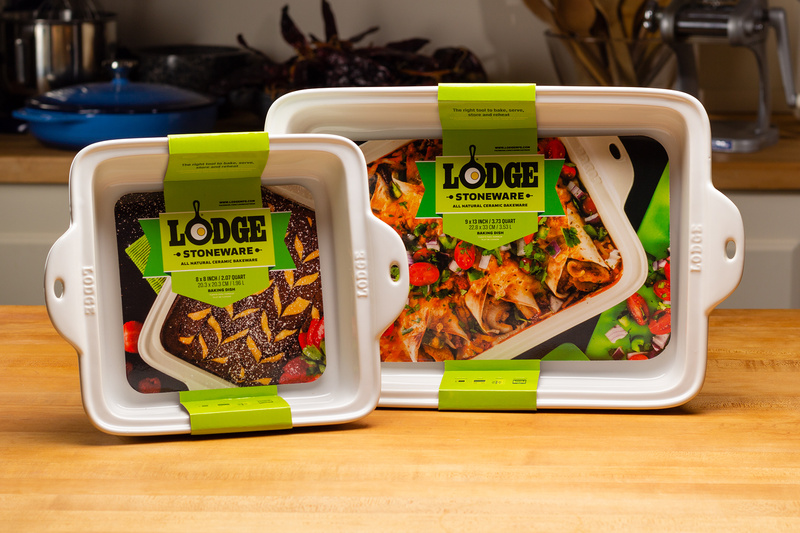 2-piece Lodge Stoneware casserole/baking dish set courtesy of Lodge Manufacturing. The prize included a 9” X 13” (3.73 quart) baking dish and an 8” X 8” (2.07 quart) baking dish, both in Lodge Manufacturing’s popular new tone, Oyster White. Simply by making and plating your own version of the chosen FO5O recipe for the current challenge and emailing us the best photo you can create. Entries must be emailed to cookandplate@foodover50.com. Contestants must adhere to the specific ingredient list when preparing the chosen recipe for each Challenge. Once prepared, contestants may then use their own choice of external garnishes, tableware or other accents to plate and style their creation. If the recipe calls for carrot or parsley, and there is no visible carrot or parsley in your dish, this is grounds for disqualification of your entry. Beyond this, each entrant is free to plate and style the recipe as they wish. Entry photos must be emailed to cookandplate@foodover50.com by midnight of the closing date of each challenge. Late entries will be ineligible. Each participant must submit ONLY ONE PHOTO in jpg format that is 1,600 pixels wide or greater at 72dpi. If the cook in your household is not a photographer, get help taking the picture. This is allowable. One week after close of each contest the single FO5O Cook & Plate Challenge winner will be notified by email and must be able to provide a physical mail or delivery address in order to receive their prize. If not, the prize is forfeit and will be awarded to the runner-up contestant. Contestants may enter only once per Challenge. Contestants may enter multiple Challenges throughout the calendar year, however for the sake of fairness to all contestants, once you have won a challenge, you are ineligible to participate again for a period of one year. The Food Over 50 Cook & Plate Challenge is a free, no obligation, online contest offered to Food Over 50 viewers. Judging is solely at the discretion of Mojave Productions, it’s ownership, staff and assigns. All decisions are final. Food Over 50 and Mojave Productions, its ownership and staff, are not responsible for any loss, damage or injury, by or to any and all participants in the pursuit of this contest. All photos submitted to The Food Over 50 Cook and Plate Challenge will become the sole property of Mojave Productions and Food Over 50, and may be published online or elsewhere at our discretion. ​Check Back Often to Find Out When the Next Cook & Plate Challenge is Happening!